Andre Rieu Magic Of The Violin DVD. 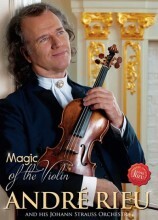 Central to everything that André Rieu does – touring, recording, composing – has always been the Violin. 'Magic of the Violin' on DVD features 18 unforgettable, uplifting melodies, personally selected, compiled and of course, played by André himself, accompanied by his own Johann Strauss Orchestra. Delight in movements from his popular orchestral works from the rousing "My Way," to the divine "Song To The Moon." The DVD release is a visual testimony to these trakcs as performed in André's unforgettable and evocative concerts. In addition, the DVD features extra tracks, including "You Raise Me Up" and "The Godfather Waltz." The violin is central to everything that Andre does. Magic of the Violin on DVD features 17 unforgettable, uplifting melodies, personally selected, compiled and of course, played by Andre himself, accompanied by his own Johann Strauss Orchestra. This DVD is a visual testimony to those unforgettable and evocative concerts, and a captivating visual journey through some of Andre's best performances in recent memory. Click the button below to add the ANDRE RIEU - MAGIC OF THE VIOLIN to your wish list.